FAQ – How do I get my roof painted? Why is painting roofs so common? Painting of colorbond roofs: If the colour of the existing roof is not to your liking, then you can repaint it. Painting of rusty metal roofs: This is only a temporary fix. Rust can never be completey ‘killed off” by a rust converter and soon the rust spots will bubble through the new paint work. And who treats and paints the laps where the worst rust happens? When the old metal roof sheeting have end joints, the new paint can obstruct the drainage. Suddenly you get a roof leak where it has never happened before…. Painting of concrete tiled roofs: Painters have a better chance with concrete tiled roofs. Fresh paint will stick well to worn concrete roof tiles that are cleaned well and primed. But excessive paint in the wrong areas can still bring on the new leak on a ‘restored’ roof. 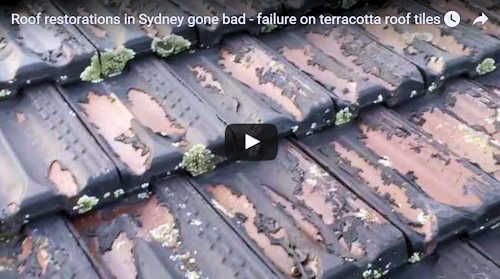 What ever you do, don’t let the painter/roofer who repaired this roof on your premises! Painting of gutters: Gutters are usually painted to match certain parts of the house. Colorbond only comes in a limited range of colours and you may want a special -non colorbond colour for the gutters. There is no reason to paint the inside of the gutters – only the outside can be seen – and this is the only side that has to be painted. Hi I want to know if the edge of the tile nearest the guttering should be painted when having a roof restoration and reprint done on my home. The roof looks great but the edge of the lowest set of tiles hasn’t been painted and it looks tacky. Can’t be seen unless you climb a ladder or look in from the neighbours house but I want to know if this is a dodgy job or should I not finalise payment until this is fixed? The ‘nose’ of the tiles did not get painted because it was ‘too hard’ for your painters to do it. All the noses of the other rows of tiles are painted. So, it makes sense that the last row of tiles should have their ‘noses’ painted too. However, to paint the last row, the painters have to cover up the gutter so that they do not get ‘paint overspray’. Lazy painters (or cheap ones) do not have time to take this extra step – so they conveniently leave the ‘noses’ of the gutter row of tiles unpainted. If you paid for a quality job – then all the ‘noses’ should be painted. However, if you agreed to a ‘cheap’ job – then you will have to settle with what they have done….